Today, little of the Point Pleasant battlefield remains. 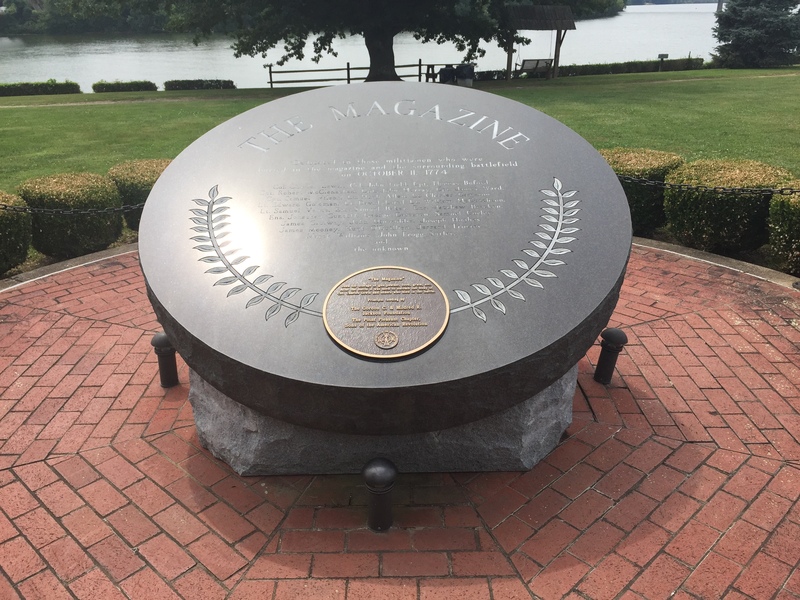 A small park, of about four acres, at the confluence of the Kanawha and Ohio Rivers is the only preserved portion of the battlefield. Known as Tu-Endie-Wei State Park, it commemorates the October 10, 1774 Battle of Point Pleasant. “Tu-endie-wei” means “the point between two waters” in the Wyandotte Indian dialect, a fitting name for the point at the confluence of two great rivers. A detail of the frontiersman depicted on the obelisk. 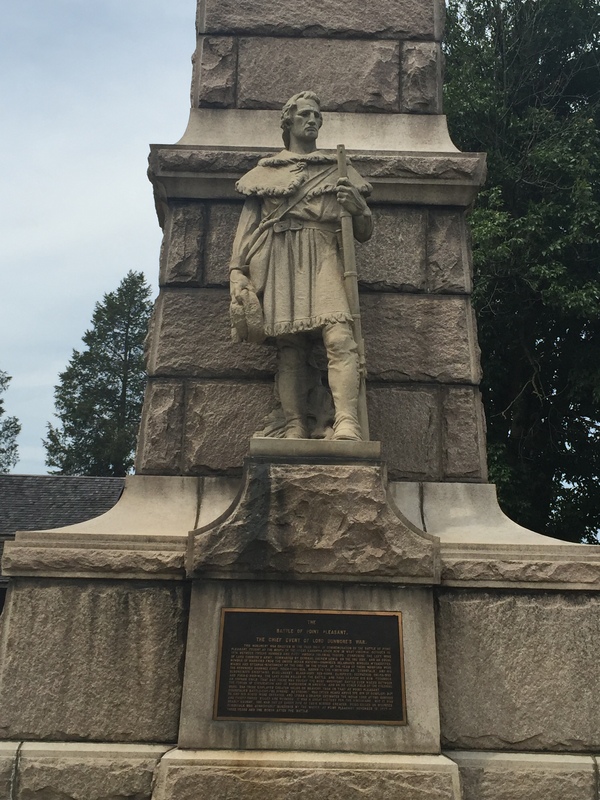 the Virginia militiamen who fought and died at Point Pleasant, and a statue of a frontiersman stands at the base of the obelisk. Smaller memorial tables scattered throughout the park honor Chief Cornstalk and “Mad” Anne Bailey, whose husband was killed in the battle. 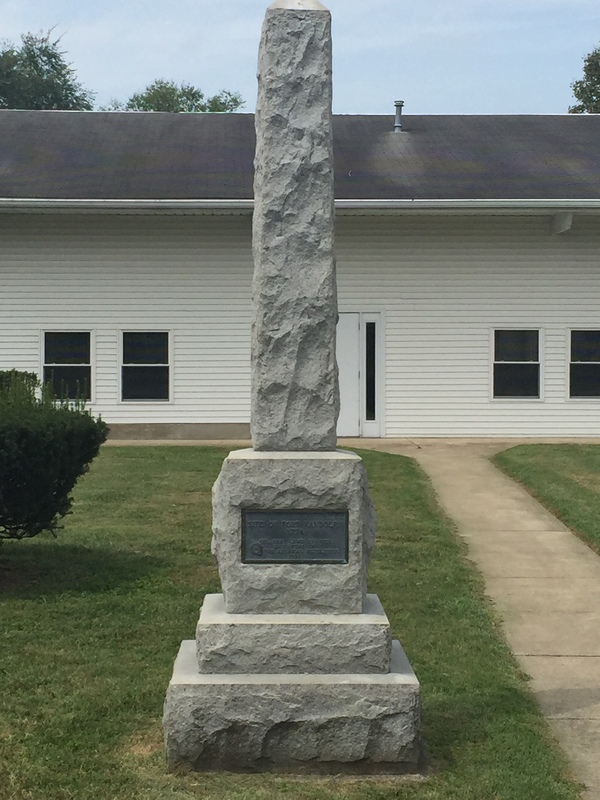 A large and prominent monument marks the location of Camp Pleasant’s powder magazine. The 1796 Mansion House, erected by Walter Newman as a tavern, while not pertinent to the battle, is the oldest hewn log home in the Kanawha Valley and serves as both museum and visitor’s center for Tu-Endie-Wei State Park. 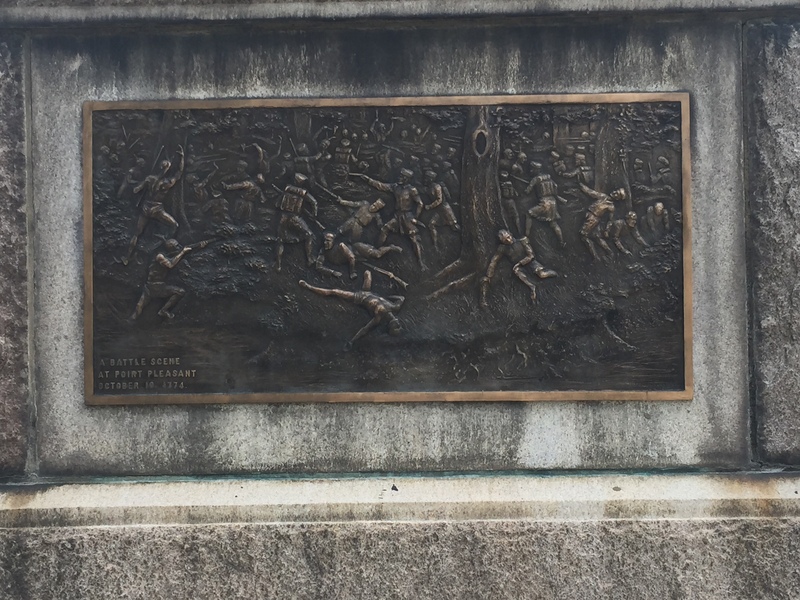 A depiction of the battle on the obelisk. 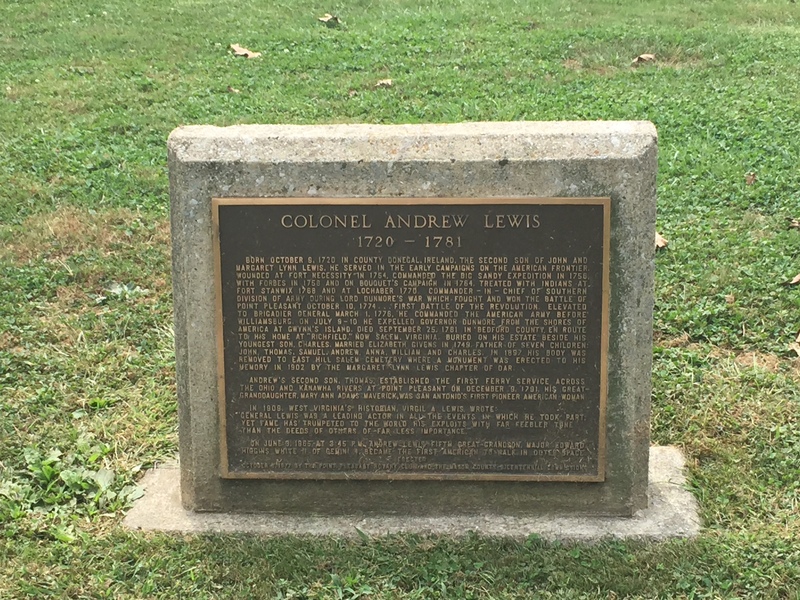 Monument to Col. Andrew Lewis. A large Army Corps of Engineers floodwall separates the Ohio River from the town of Point Pleasant. The side of the floodwall facing the river has been adorned with a handsome mural showing the history of the area, and depicting the battle. 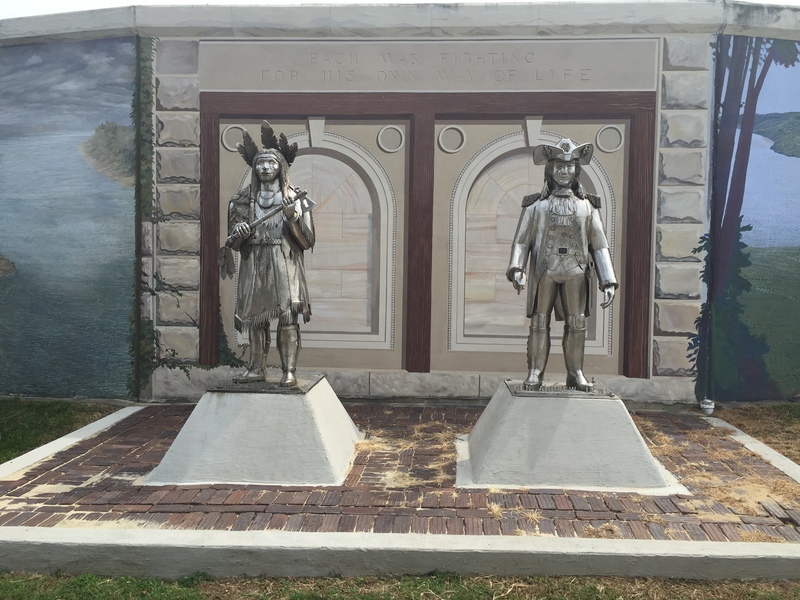 The mural extends for nearly a mile, and there are a number of odd modern sculptures along the river walk depicting some of the more important figures of the Battle of Point Pleasant, including Lord Dunmore, Chief Cornstalk, and Colonel Lewis. Done in an abstract, modern style, these statues are impressionistic representations of these important historic figures and are probably worth a visit. 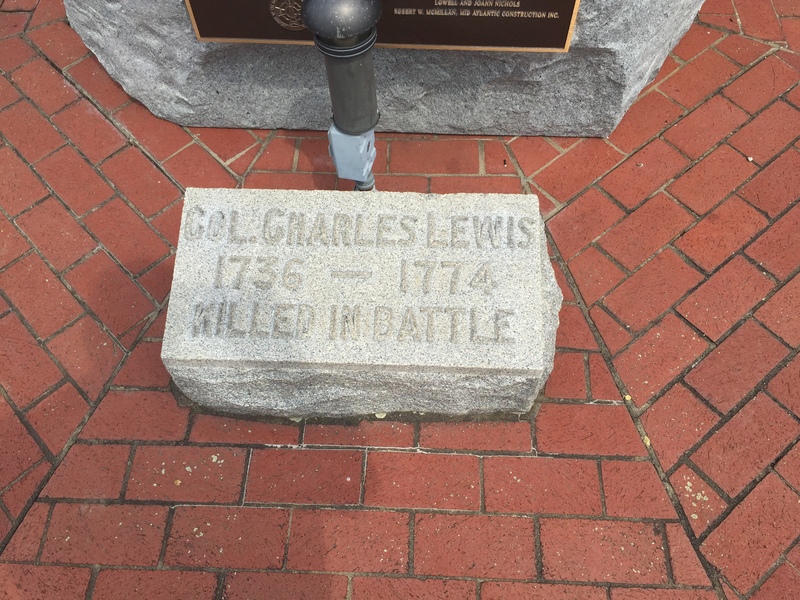 A marker commemorating the death of Col. Charles Lewis at Point Pleasant. Unfortunately, the history of the Battle of Point Pleasant has been dwarfed by subsequent events. 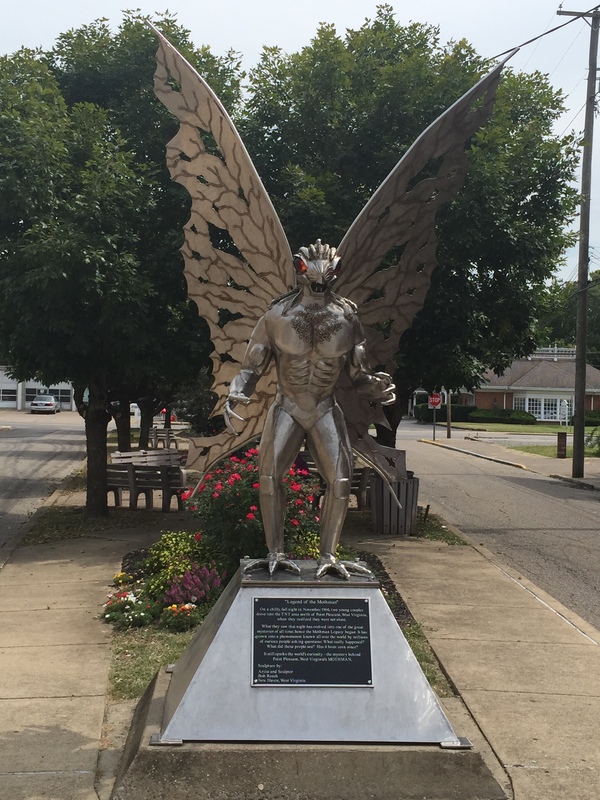 Paranormal enthusiasts flock to Point Pleasant in search of the Mothman, a mythical creature said to be a harbinger of imminent disaster that inhabits an abandoned dynamite factory dating from World War II. In 1975, John Keel published his novel, The Mothman Prophecies, and a bad 2002 movie was made based Keel’s novel. A second film, also loosely based on the legend, was released afterward. There is a Mothman Museum that holds an annual Mothman Festival that offers tours and other silly events that celebrate the Mothman legend. Sadly, none of this focuses on the events of October 10, 1774, which languish largely forgotten. Marker for the Virginia troops’ powder magazine. All of the focus on the Mothman diverts attention away from the Battle of Point Pleasant, which can fairly be called the opening engagement of the American Revolution. 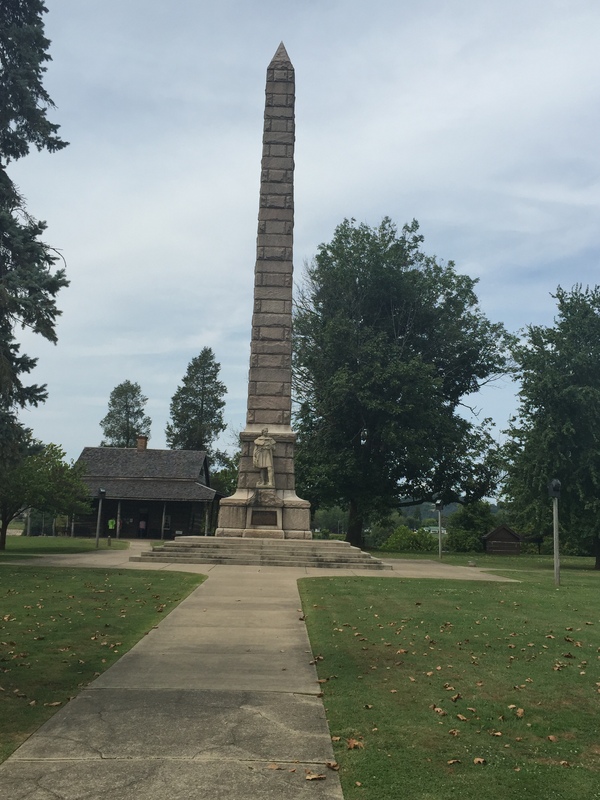 The Battle of Point Pleasant, as a landmark event, deserves better, and I hope that by focusing on this important battle, you will now appreciate the significance of it, and that you will visit Tu-Endie-Wei State Park if the opportunity ever presents itself. 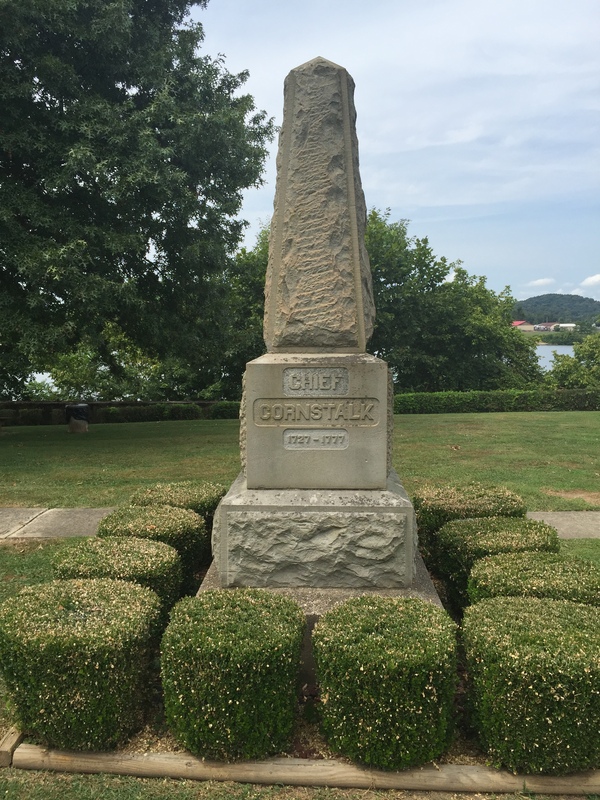 Statutes of Col. Lewis and Chief Cornstalk. If Dunmore’s War serves as the epilogue to one story, it is the prologue to another: the story of American independence. The events of the preceding decade amounted to nothing short of a revolution in backcountry affairs, and the military campaign led by Lord Dunmore against the Ohio Indians constituted the opening chapter of a new epoch in American affairs. From the perspective of the backcountry, the shots fired on the Ohio late in 1774, not those at Concord six months later, constituted the beginning of the American Revolution. Though the Ohio campaign was led by a royal governor, its muscle was provided by two thousand men who had waited a decade in mounting frustration and anger while the king neglected their needs. This was their declaration of independence. As a side note for those looking for more information: there is no good modern monograph in print on Lord Dunmore’s War. I relied upon two very old books for much of information included herein. However, there is a new monograph that is scheduled to be published in the spring of 2016 that I am looking forward to reading. It was a good trip and a great series!